We had a long weekend, so you know what that means: we had to find an open road and drive as far and as fast as we could. This time, we flew to Chicago and drove around Lake Michigan. 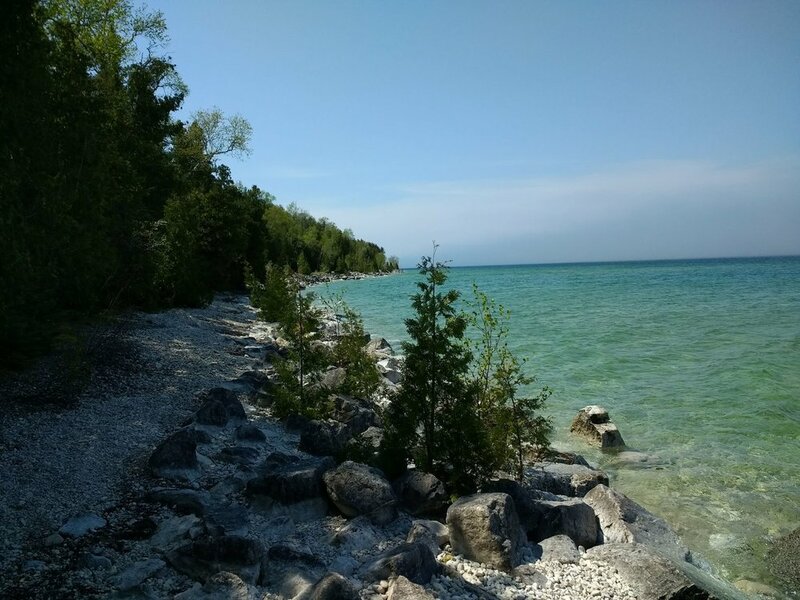 We wanted to see Door County, Wisconsin, we wanted to see Mackinac Island, we wanted to explore Sleeping Bear Dunes National Seashore, we wanted to take a look at the quaint Victorian lakeside towns of northern Michigan. That was a lot of "wants" for four days, but we looked at the drive times, saw it could be done, and took off, feeling pretty proud of ourselves for thinking this trip up in the first place. Imagine our surprise when we began to see these signs, indicating that we are not the first to come up with this idea. Fly to Chicago early Friday morning. Drive up through Door County, Wisconsin, and back down to spend the night in Green Bay. 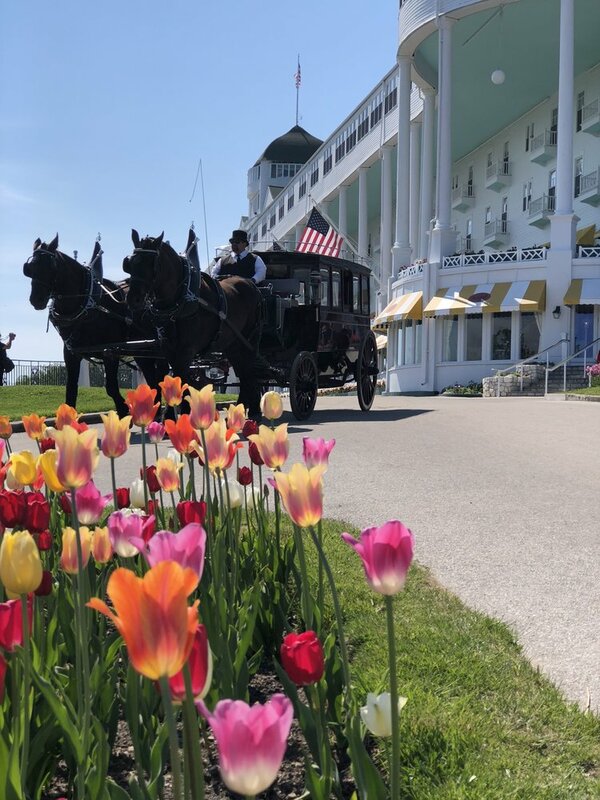 Drive north to Mackinac Island, then spend the night in Petosky, Michigan. Head south via Sleeping Bear Dunes and cute Victorian towns to Chicago. Spend Monday morning in Chicago and head home in the evening. So Friday morning came, and we rose before the dawn. You know that you're at the airport early when all the airport employees are on the bus with you. No sooner had we boarded the bus, however, than we got the "ding" of a flight notification, announcing a 2-hour delay. "Oh well," we said, "These things happen. We still have time for Door County." Then we landed in Chicago and fell into the strangest car-rental snafu of all time, resulting in a further 3-hour delay. At this point, we had to face the sad fact that the scenery of Door County would be unviewable in the dark, so we drew a line through that part of our itinerary and continued on to Green Bay, through all the gentle green goodness of Wisconsin farm country. Now. We live in Dallas, where football is a big deal, and we were going to Green Bay, where football is also a big deal. We had a certain picture in our minds of cities where football is a big deal. What we'd known of Green Bay up to this point was a giant stadium full of rabid fans, so we were expecting a big noisy city. Instead, on a Friday night, we found Green Bay to be a sleepy town made up of adorable Victorian homes and industrial parks, where it seemed everyone had already gone to bed by the time we rolled in around 7 p.m.
Yelp found us a traditional Friday fish-fry place, and it turned out that's where everybody was. The highlight of the fish fry: cheese curds, THE things you're supposed to eat in Wisconsin. Whenever I'd heard "cheese curds" before, I thought it must be something like cottage cheese, but "cheese curds" turned out to be lumps of fresh cheese, like Mozarella, deep fried in batter. No wonder everybody raves about this stuff. Get thee to Wisconsin. Eat the cheese curds, my friends. In the morning, we continued through farm country and into the Big Woods, carpeted in the first wildflowers of spring. We arrived in St. Ignace, and grabbed the lunch you're supposed to eat in Northern Michigan: pasties, like the original Hot Pocket: a pastry shell with meat filling. Delish! Then we were off to Mackinac Island. There are no motorized vehicles on the island, just lots of horse-drawn carriages and bicycles. The town of Mackinac is quaint and cute, full of fudge shops and tourists. I'll always be a fool for the scenery, though, so the highlight for me was the tandem bike ride around the perimeter of the island, stopping to climb to Arch Rock and enjoy the shoreline along the way. In the evening, we headed back to the mainland and over the Mackinaw Bridge, which is like a fraternal twin to the Golden Gate Bridge, painted green instead of orange. When you drive on the dark lane in the center of the bridge, it sounds like the bridge is singing a dirge-y kind of bridge song. We spent the night in the cute little town of Petosky, Michigan. In Petosky, we ate the thing you have to eat when you're this close to Canada: poutine. Which, if you have yet to experience the wonder of poutine, is french fries covered in a cheesey gravy--and if you're lucky, like we were at Beard's Brewery--beer cheese crumbles. I'm showing you this picture so that you'll know what it looks like, and if anyone ever asks you if you want to eat this, you will know that the answer is "YES." The next morning was Sunday, and we hit the road for Sleeping Bear Dunes National Lakeshore. We passed by a sign for the 45th parallel, and realized that we'd gone halfway to the North Pole on this trip. We got to Sleeping Bear so early that the park rangers hadn't arrived yet, much less any other tourists. It was perfectly still, quiet, and beautiful. Arriving back in Chicago to the noise and energy of the big city, we ate the thing you have to eat in Chicago: Giordano's deep dish pizza. In the morning, we ate a maple-and-bacon donut from Do-Rite Donuts, a donut of such deliciousness that songs should be sung in praise of its pleasure to the palate. And then we tried to walk it all off on a self-guided tour of the public art in downtown Chicago. By this time, temperatures were rising and we were ready for a little misting from Buckingham Fountain and some refreshing greenery in Luray Gardens, which is so full of flowers that a breath of fragrance comes to you before you even enter the garden itself. Cloud Gate is probably the most famous piece of public art in Chicago. I confess that the first time we visited, I wasn't expecting much. In the photos, it just looks like a giant shiny bean. But when you're there at Cloud Gate, everyone is walking around it, and underneath it, and taking photos from various angles. There's a sense of discovery and fun, just being in the presence of this giant shiny bean. Cloud Gate is lovely in every way: not just in how it appears, but in how it draws everyone into a joyful shared experience. Just a few steps from Cloud Gate is the Crown Fountain. The faces on the fountains change and move, and occasionally shoot water out of their mouths, to the shrieking delight of the kids. We finished our tour with Sounding Sculpture by Harry Bertoia, at the Aeon Center. When the wind blows, the metal rods of the sculpture move and knock into each other like wind chimes. Our weekend getaways are kind of nuts, I know. We drive really far and pack in a whole lot. Andy said to me the other day, "I read an article about 'slow travel' where people go someplace and stay for a whole week." We looked at each other and laughed. Maybe someday we'll linger a bit more, but for now, there's a big, big beautiful world out there, full of wonder. So we're going to keep flying and driving, biking and walking, fast and far. Because there's always, always more to explore.